This June 23, 2018 photo shows the Red Hen Restaurant in downtown Lexington, Va. White House press secretary Sarah Huckabee Sanders said Saturday in a tweet that she was booted from the Virginia restaurant because she works for President Donald Trump. President Donald Trump is trash-talking a restaurant that asked his press secretary, Sarah Huckabee Sanders, to leave because she worked for his administration. Trump said in a tweet Monday morning that The Red Hen restaurant in Lexington, Virginia, "should focus more on cleaning its filthy canopies, doors and windows (badly needs a paint job) rather than refusing to serve a fine person like Sarah Huckabee Sanders." "I always had a rule, if a restaurant is dirty on the outside, it is dirty on the inside!'' added Trump, an admitted germophobe, who has said he prefers eating at fast food chains rather than independent eateries because he trusts them more. Photographs of the restaurant, a three-hour-drive from Washington, appear to show no evidence of serious disrepair to the red building with hunter green awnings and white doors and trim, though recent images appear to show some awning wear. The restaurant passed its latest state health inspection without any violations, NBC News reported. Past years showed minor or no violations. In contrast, Trump-owned and Trump-branded properties including the Mar-a-Lago resort and DJT steakhouse at the Trump International Hotel in Las Vegas have faced past violations over food safety. Sanders tweeted over the weekend that she was asked to leave the restaurant by its owner Friday evening because she worked for Trump's Republican administration. Sanders said that she "politely left" and that the owner's "actions say far more about her than about me." "Healthy debate on ideas and political philosophy is important," she told reporters at a White House briefing. "But the calls for harassment and push for any Trump supporter to avoid the public is unacceptable." Sanders added: "We are allowed to disagree, but we should be able to do so freely and without fear of harm. And this goes for all people regardless of politics." The restaurant's co-owner, Stephanie Wilkinson, did not immediately respond to a request for comment Monday, but she told The Washington Post that her reasons for booting Sanders included the concerns of employees who were gay and knew Sanders had defended Trump's desire to bar transgender people from serving in the military. The displays of hostility have set off a fierce debate about whether politics should play a role in how administration officials are treated in public, with Sanders' father, former Arkansas Gov. Mike Huckabee, denouncing his daughter's treatment as "bigotry." 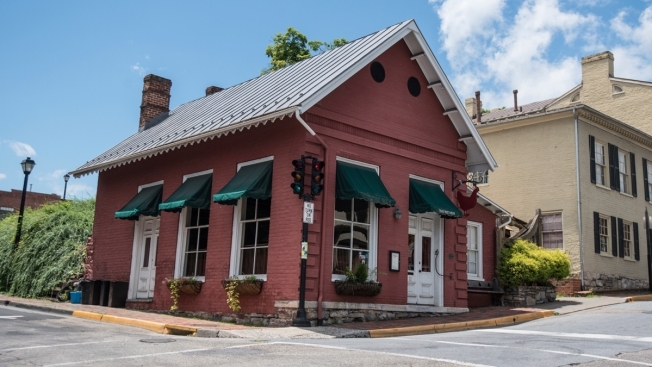 The Red Hen restaurant in Washington, D.C., that has no relation to the Lexington establishment received misdirected attention after Sarah Sanders' tweet. The restuarant posted a statement to Twitter and Facebook for clarification. There's also a restaurant by the same name in Swedesboro, New Jersey, that also had to put out a statement on social media, NBC10 reported. Correction: In an earlier version of this story, information that the Red Hen restaurant in Washington, D.C., had no relation to the Lexington establishment was incorrectly deleted. The two restaurants are not affiliated.